This is an especially handy trick if you want to change a password on an account but you’ve forgotten the old password. You need to have admin access to perform this change from the command line. Step 1: First of all, you have to open a elevated Command Prompt. Step 2: To do this, click on Start button. Step 3: Go to All Programs . Step 4: Then Accessories . Step 5: Right click on Command Prompt and select “Run as Administrator” from context menu. Note: In Windows 8, you can do this by simply pressing Windows Key + X + A. Step 7: Replace “username” with your “Windows account name”, and “new_password” with your “desired new password”. Note: You need to use a bootable media to change Windows password if you’re totally locked out of Windows, you’re unable to run any program such as command line tool to change your password. Instantly unlock your system if you have forgotten Windows password or user account is locked out or disabled. 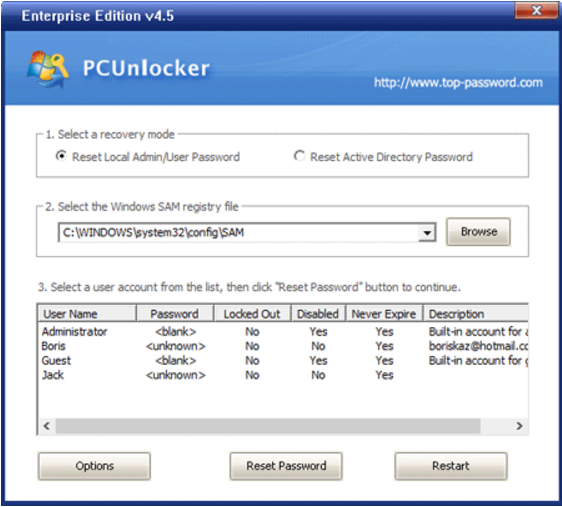 PCUnlocker is a bootable utility to bypass / reset forgotten administrator or other user passwords on Windows 10 / 8 / 7 / Vista / XP / 2016 / 2012 / 2008 / 2003 / 2000 and Active Directory (AD) servers. Step 1: At first, you have to use another PC to download the PCUnlocker program, which comes as a bootable CD image. Burn the ISO image to a blank CD or USB drive using the ISO2Disc utility. Step 2: Insert the newly burned USB drive or CD into your target computer, and set it to boot from CD/USB. Step 3: You’ll be presented with the screen of PCUnlocker, once you’ve booted into the CD/USB drive. This program automatically locates the SAM database file for your installed Windows operating system, and shows you a list of local user accounts. Step 4: Select a user account and click on Reset Password button. It will remove your old password immediately. Step 5: Restart the computer and you can then log into your Windows account without typing a password!